Monday was All-Access Hour with the players so a very busy day. I’d opted to watch the matches on the outside courts and skip the first few press conferences – watching tennis is always my priority and it was such a lovely day. When I found out that Petra had a press conference scheduled, I knew I had to make it! I had questioned whether she might pull out of Eastbourne after her magnificent win in Birmingham which it was announced earlier today that she had. Sadly i’ve been wrapped up in Eastbourne shenanigans but Petra is inspirational and i’m so, so happy for her. Unfortunately @Petra_Kvitova has withdrawn from the #AegonInternational #Eastbourne with an abdominal strain. Before Petra, there was a press conference with Johanna Konta. The Brit seemed in a good mood and talked about home comforts since she lives in Eastbourne. She had a standard press conference before conducting more interviews with the newspaper press. 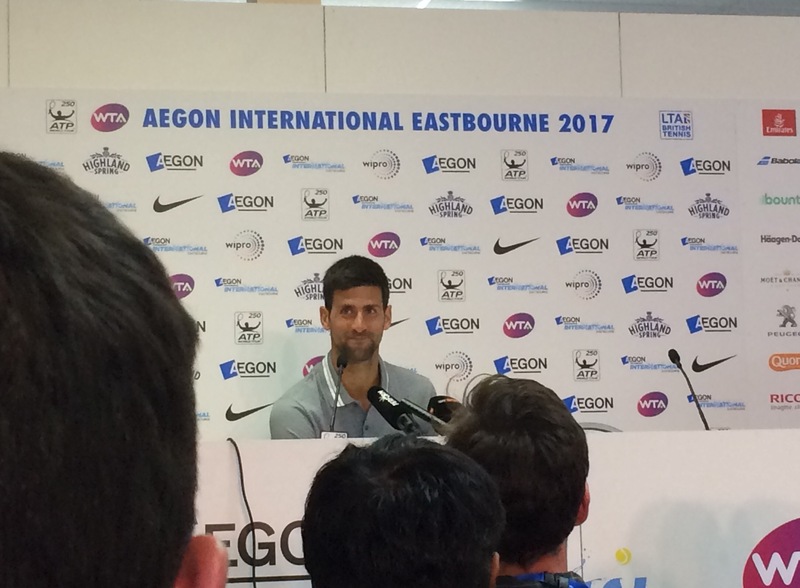 Then it was Novak Djokovic – I don’t follow the ATP so much now but I couldn’t pass off this opportunity to see Novak in press. I do like Novak and he gave a lot of thoughtful answers. The journalists present were fighting to get their questions in and talking over one another – it was absolutely brutal! I’ll need to build up my confidence if i’m going to ask any questions this week as the media centre is much, much busier compared to last year. 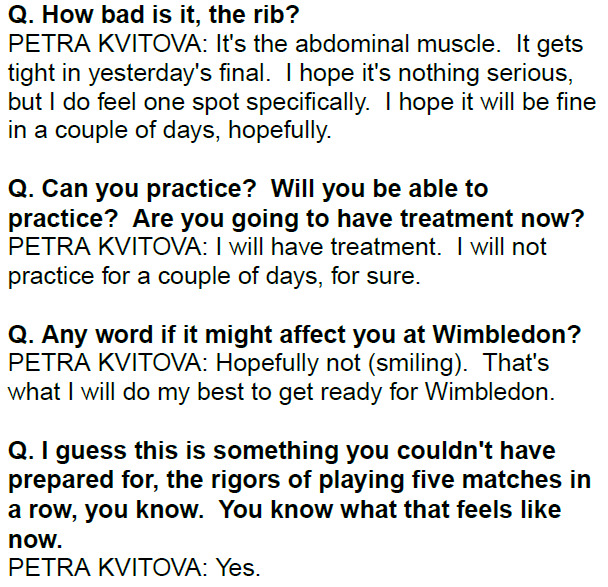 Petra talked about the abdominal injury that forced her out of Eastbourne and the impact on preparations for Wimbledon. A journalist asked Petra about 24 hours on from winning Birmingham and she looked at her watch and giggled in true Petra style. I was so thrilled to get to see Petra, even if it won’t be on a tennis court this week. 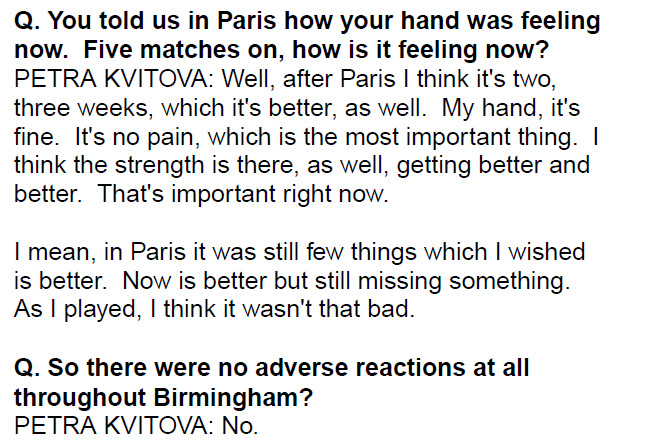 And finally, Petra also reiterated that she is feeling no pain in her hand. I’m hoping to bring you more insights from some of the press conferences as it’s a unique opportunity for me to share this week. My priority for now is still to watch and report on as much tennis as I can from the outside courts as there is so much going on. It was then back out to watch the second set between Francesca Schiavone and Peng Shuai, which was a good battle with plenty of breaks in the second set. Peng Shuai had a vital hold to 4-4 with back-to-back aces. Both players lost their cool with the umpire – Peng was adamant a Schiavone shot was way long of her baseline. Schiavone was even more vocal during a disagreement with the umpire for a point she wanted to be replayed at a critical juncture of the match. Thanks to Ashish Jena on Twitter for clarifying as I wasn’t fully aware at the time what had happened! The spectators around me seemed to think Schiavone would lose the point anyway but she was furious and said to the umpire “you shouldn’t work here”. She also said on the changeover that “the WTA is a disaster” 😂. Schiavone never really recovered mentally from the outburst as Peng served out the match in convincing fashion, 6-3 6-4. Still, Schiavone shook hands with the umpire, despite the disagreements, which I liked. A good win for Peng and her first on grass since 2014. I stayed on court 3 for the first set of Daria Gavrilova vs. Lara Arruabarrena. It was a high level from both and I thought Gavrilova was superb. The Aussie was really sharp and aggressive. I’m kind of shocked that Arruabarrena got the win in three sets, 2-6 6-2 6-3. Credit to Arruabarrena who also knocked off Tsvetana Pironkova in the final round of qualifying. Dasha is so much fun to watch live and photograph. I love how she gives a running commentary of what is happening – for example, she shouted out “too short” after Arruabarrena swatted away a winner and then “great serve” after one of her own serves 😂. I finished my day with the first venture this year to Court 2 where Anastasia Pavlyuchenkova took on Elise Mertens. I’d never seen Mertens before and Pavs not for quite a few years too. I felt like Pavs had the first set on her racquet but too many errors into the net were her undoing. She also didn’t help herself by arguing a line call on a first serve of hers called out down break point at *3-4 *40-Adv. This caused a delay and she then double faulted, gifting Mertens the break and then the set. Mertens had a set and a break lead but Pavlyuchenkova, slowly but surely, began to find her form and took advantage of Mertens’s balls landing short. The Belgian player threw in a shaky final game with Pavs levelling up at one set all. Into a third set and Pavs had the momentum. Her game looked really strong as she outhit and outpowered a struggling, Mertens, who took a medical time-out for a leg injury with Pavs leading 4-1. It didn’t kill her momentum though as the Russian player came through for the win, 4-6 6-3 6-1. 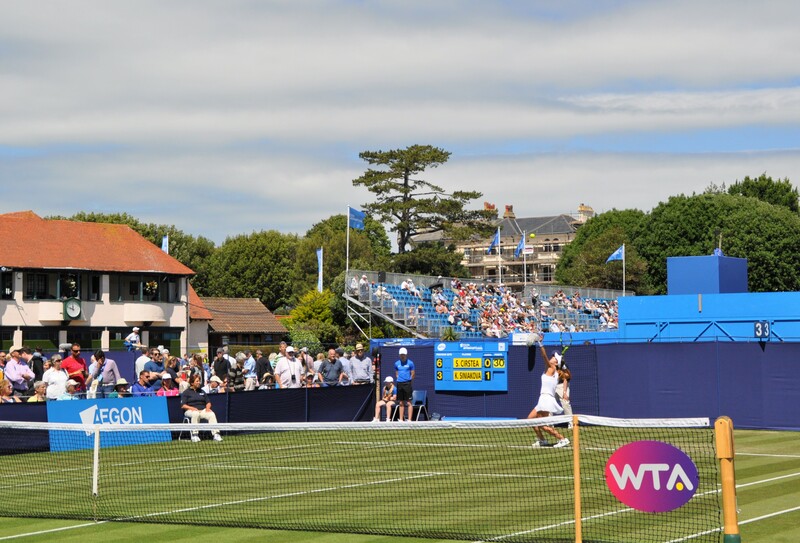 Today was a lovely day in Eastbourne with some great tennis on show. Fingers crossed that the weather isn’t too dreadful on Tuesday because the schedule is awesome! 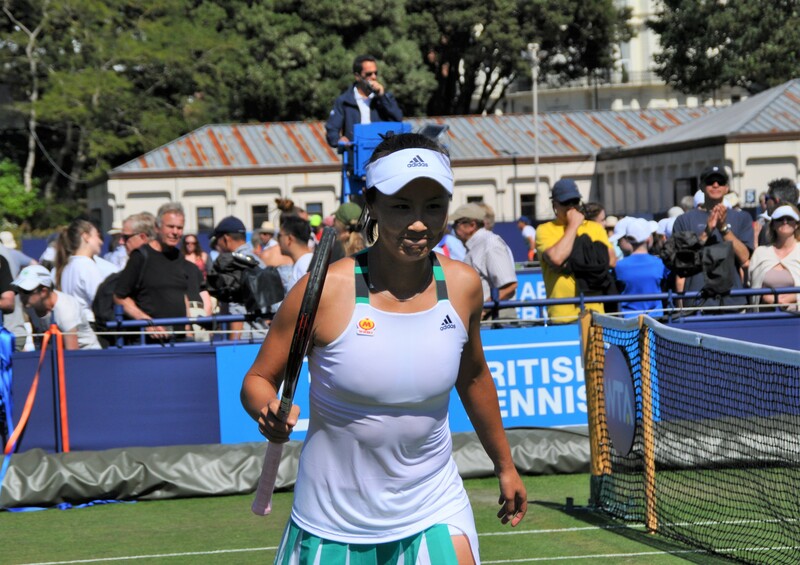 June 26, 2017 in Eastbourne, Set Points, Tournament Report, WTA. Alas, poor Francesca. A couple years ago during the American hard court spring series she had a big disagreement with a chair umpire over a double bounce call in her opponent’s favour and quickly lost control of the match after that. 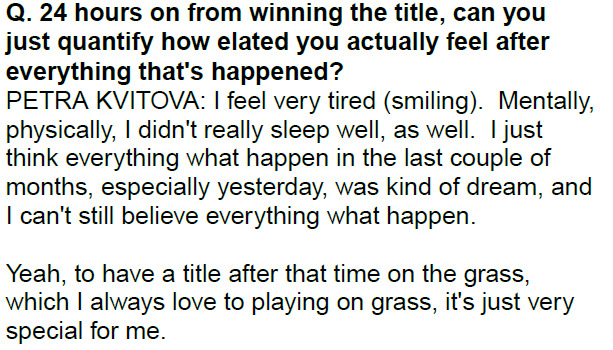 She’s a real fighter though and it was great that her last (singles) match at Roland Garros was given the big stage. (Her doubles matches with Flipkens, on the other hand… And she was winning those ones, too.) Her huge grin after that trademark half-volley drop shot was vintage Schiavone! It’s so wonderful to see Petra back in the winner’s circle so soon — just seeing her on the court at the French Open was amazing, and now she’s hoisting trophies again! Ashley Barty’s becoming a regular for late tournament matches herself, too. Let me bring you up to speed on the last few months of ATP action: Nadal won (almost) everything, including #10(!) at Paris, Zverev the younger and Thiem did a bunch of winning, Murray and Djokovic did a bunch of losing (relatively speaking), and Tommy Haas has been making a good show of his final competitive season, including knocking out Federer on grass a couple weeks ago. Frankly, the most surprising thing that happened was that Wawrinka’s perfect record in Slam finals was broken, although on the other hand he did walk away from the French Open with yet another new piece of silverware for his collection. The reason I mention the ATP is that Djokovic’s match against Pospisil today has me really excited. Vasek, who grew up in my home city of Vancouver, has been playing well lately, and I think he’s got a great chance of winning this one, so if you happen to see some of it or get pictures I’d love to hear about it! Definitely would recommend Eastbourne if you’ve never been. He only confirmed last week and it was already a sell out on Centre Court for most of the week.